In May of 1986 Lee Sedgwick, Gary Counts and Sue Taft (Spectrum Flight) invited me to visit them in Erie, PA. “Al, there’s a huge beach and a lot of people visit Erie on Memorial Day weekend,” Lee told me. “But Lee, I heard that they are going to have this stunt kite thing on the East Coast, someplace in New Jersey that same weekend”. Lee convinced me that it would be much more fun to fly in Erie than to travel all the way to Wildwood, New Jersey. You mean they are going to have rules at this event? 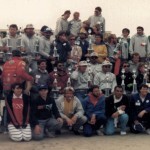 Wildwood and the East Coast Stunt Kite Championships have had so many firsts in sportkite competing that it is really hard to list them all. This event was the brainchild of several East Coast fliers. 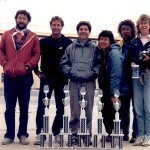 At the top of that list were Fran Gramkowski, Roger Chewning, Olan Turner and Mike Carroll. There had been several other stunt kite competitions held before. 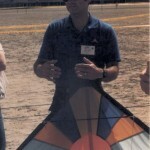 The AKA had been hosting a “competition” for dual line kites since 1982. So the fact that a competition would be held on the beach in Wildwood wasn’t a big deal. What was a big deal was that this event would actually have a series of rules to govern the event. The main people involved in the creation of the rules were Mike Carroll and Olan Turner. They wanted to quantify the area of judging and give it some official and organized status. Olan and Mike did research in other competitions that judged movement and music. They visited figure skating contests, and drum and bugle corps competitions. They talked to the judges and gained ideas on how choreography and movement were scored. 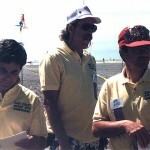 Mike and Olan became the core of the original judging staff for the first East Coast Stunt Kite Championships. The first actual rules booklet was produced in the 1987-88 season. The 1987 AKA National Convention used a variation of the Wildwood booklet for that year’s Grand Nationals. There was a bit of controversy at the time as to who actually “owned” these rules. The east coast people gladly shared this book. They knew even then that national consistency was very important to this infant sport. I realized as I began to write this chapter of Tangents and Trivia that I could not list all the firsts that I know happened in Wildwood, because a bunch of people across the country would argue that they were first with this or that. 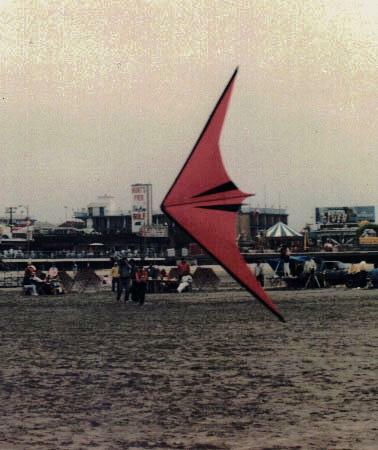 Suffice it to say that the East Coast Stunt Kite Championships were innovators in an era when there was very little “official” anything, and a very large and very interested group of fliers. What’s this brown stuff coming out of the motel faucets? The first East Coast events took place farther north of the current flying fields. There were not many contestants back then and the lace to stay was the Quarter Deck Motel. Looking back on that place it was kind of a hole! 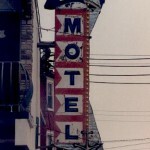 But it was the headquarters motel and the stunt fliers took over the entire place. Memorial Day weekend was (and still is) the kickoff weekend for the Wildwood summer. The kitefliers were the first to occupy the Quarter Deck each season. The water in the rooms had been off all winter and it came out looking like tea the first day or two. You had to make reservations pretty far in advance to get these bad accommodations at the Quarter Deck. There were no telephones. Many times you had to help carry the refrigerator into the room, and had to help change and replace light bulbs. BUT it was the place to stay if you were anybody! Actually, it was party central. At least one or two people fell into the pool every year. We got into trouble one year for a Silly String fight. It was a crazy place, but it became home, and now, a part of history. OK Roger, what do we do now? 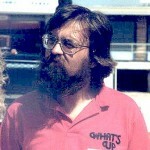 Roger Chewning was East Coast’s first Meet Coordinator. His job was to make sure that the event ran smoothly. There were thousands of things to attend to. Staff for all the events had to be scheduled. Shirts for the event, P.A. systems set up. Fields to be laid out and flagged off. Score sheets. Roger did most all of those things. Some of the people that helped make East Coast happen do not travel to Wildwood anymore. 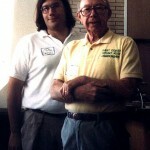 Jim Miller and Corey Jensen went on to become presidents of the AKA (A much easier job than running East Coast!!) Mike Keating from Columbus faded into the background, but was very influential in those beginning years. Dan Buxton used to live in Cleveland, Ohio and made the trip to Wildwood many years. Dan was one of the first judges in Innovative competitions. Dan went on to become one of the most respected judges on the West Coast and is regularly asked to judge at the World Cup sport kite Championships. I met Ray Merry, one of the inventors of the Flexifoil, in Wildwood. Ray resided in England then and did a lot of judging. 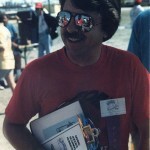 Eric Wolff of Chicago Fire fame began his competition career in Wildwood, and became the first Novice Champion in 1986. 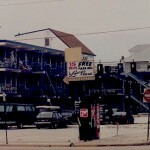 The Chicago Fire flew in their first Wildwood in 1987. (Eric Wolff, Dorothy Wolff and me). Ron Reich was a regular in the East Coast heydays, as was Pam Kirk. Pam started flying team with Vern Balodis, Mike Dennis and Sue Balodis as Hawaiian Punch. 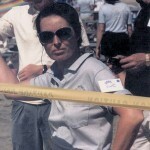 She and Mike later moved to the West Coast to fly with Ron and the Top of the Line Sport Kite Team. 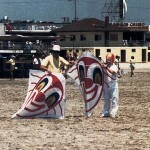 Bill Baker of Peter Powell created innovative kite performances using Clown suits and Gorilla outfits, just because ECSKC gave him a place to perform. Lee Sedgwick performed his famous “Lady in Red” routine for the first time in Wildwood. (Flying through a dog stake) Yours truly was Lee’s Field Director. 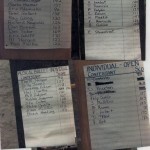 Take a look at some of the score sheets that I took pictures of over the years. Are you listed? Look at that crowd of proud winners from years when they awarded trophies on the beach. I cannot possibly list everyone that has ever been at Wildwood. Isn’t that almost everyone? Work? How do you work at a stunt kite event? 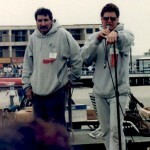 The first time I competed in Wildwood I was luck to have Bevan Brown as my Field Director. Bevan had been AKA President and eventually became chairperson of the Festivals and Competitions committee (a position I held some years afterwards). Bevan was a retired Air Force pilot and ran his competition field like the cockpit of a jet. 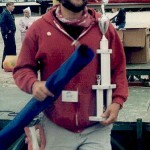 I learned a lot from Bevan in the beginning about competing AND about becoming a Competition Field Crew person. I eventually wrote a manual about what I learned. I have included a copy of this handbook for all of you. This handbook can be downloaded directly from this article. Any Official Sport Kite Event Coordinator who would like printed copies please e-mail me and I will send some along, free of charge! The more everyone knows about how sport kite competitions should be run, the easier time I will have out there competing myself. Is that all there is about Wildwood? 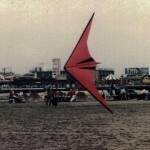 There are 13 years of East Coast Stunt Kite Championships I can tell stories about. Even if I used all of KiteLife’s space for this article I wouldn’t be able to get it all in. I wouldn’t be able to talk about all the people, teams, and pairs that have flown there. I plan to save them for other Tangents and other Trivia. Got an interesting Wildwood story? Send it along to me c/o kitelife.com (Besides Gang, I was pretty busy in France for a while – See World Cup Diary elsewhere in this issue). Are we really trained for this? This entry was posted in 1998, Issue 6 (Nov/Dec), KL Archive and tagged competition, dual line, stunt kite, team.